Our list of references includes projects completed since the 1980s. The selection has been made to include recently completed construction work for which it is possible, even today, to receive direct feedback. It is not our intention to exclude our customers and other companies who have relied on us for their industrial flooring since our inception. Indeed, we can boast of having created industrial floors for very large factories, perhaps now largely converted, for businesses whose names are at the very foundation of our national industrial world. 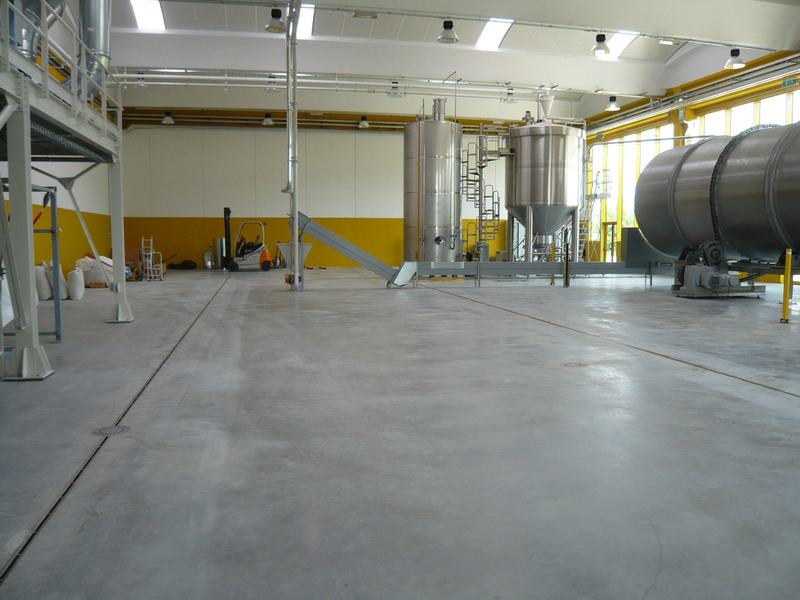 For the construction of a brewery malting area, DURSIL M was used together with a COVERSIP SC treatment, certified as HCCP flooring. 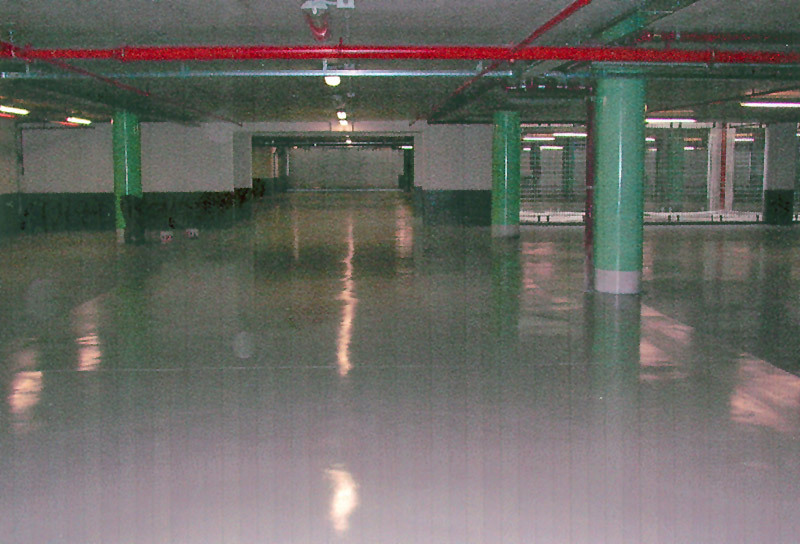 DURSIL Tiles flooring was used for an underground car park that required low thickness for access heights and had an imperfect subfloor. The ideal choice for use on floors slabs, for reduced thickness and for non-homogeneous support for 3,000m². A new production unit in Sasso Marconi (BO) of Kemet Italia, a subsidiary of the American component manufacturer, used DURSIL S and COVERSIP anti-dust treatment on approx. 18,000m² The logistics area, which is subject to tri-lateral movement, was created using DRUSIL M due to the characteristics required by the standard for VNA trucks. BADONI (BG), a manufacturer of harbour cranes used DURSIL M which was ideally suited to withstand the drag of metal structures and heavy traffic on an area of approx. 6,000m². A new modern warehouse of the Swisslog Logistics situated at the Agribusiness Centre in Rome was designed using the DURSIL 3L (Logistica Long Life) without contraction joints over 40,000m². 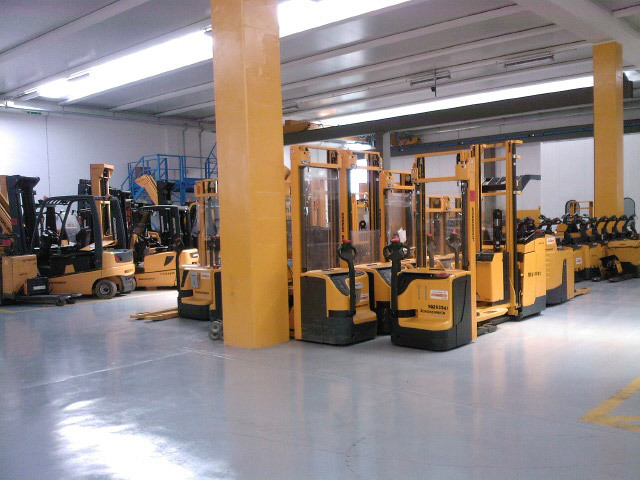 Jungheinrich Italia used CHEMIDUR F in its maintenance offices in Roma and Imola ( BO ) to cover a few m² of floor surface. The State Mint and Printing Institute, an existing customer having previously used DURSIL 5-10 and Tile in various facilities in Rome, used a 1cm thick layer of CHEMIDUR ST in its printing department on reclaimed flooring over a surface area of approx. 3,000m². Three new CNNA logistics centers at Prato of 50,000M², SAIT in Trento of 40,000M² with heating equipment on the floor and COOP, TIRRENO of 15,000m², confirming the past success of using DURSIL M 3L (Logistica Long Life). The AURELI facility for processing carrots, used DURSIL S with a COVERSIP coating on 5,000m². 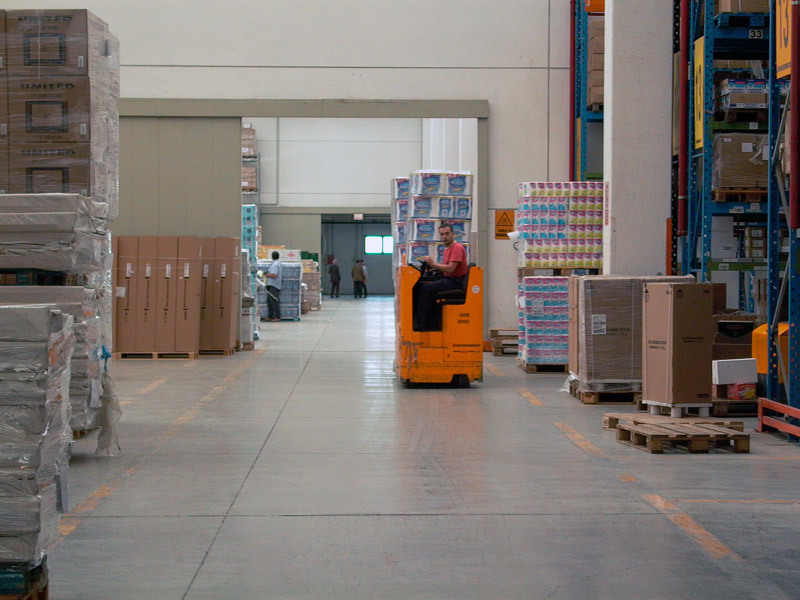 Il Logistics warehouse of SUSA and FC Trasporti di Fiano Romano and Tivoli of 6,000 and 7,000m² respectively used DURSIL M 3L (Logistica Long Life). 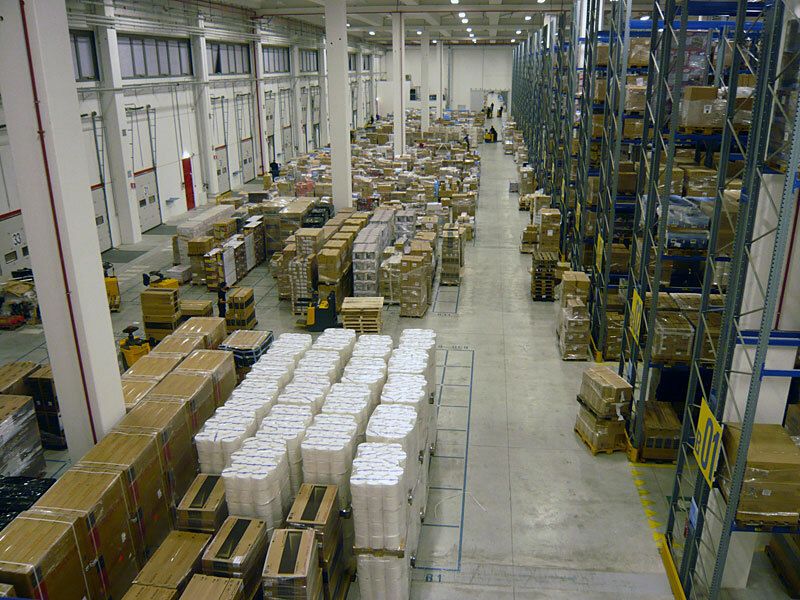 2006) Logistics warehouse of varying types, Coop Central Italia. DURSIL M 3L (Logistica Long Life) of ample size without contraction joints and metal and resin construction joints was chosen by the COOP TIRRENO. 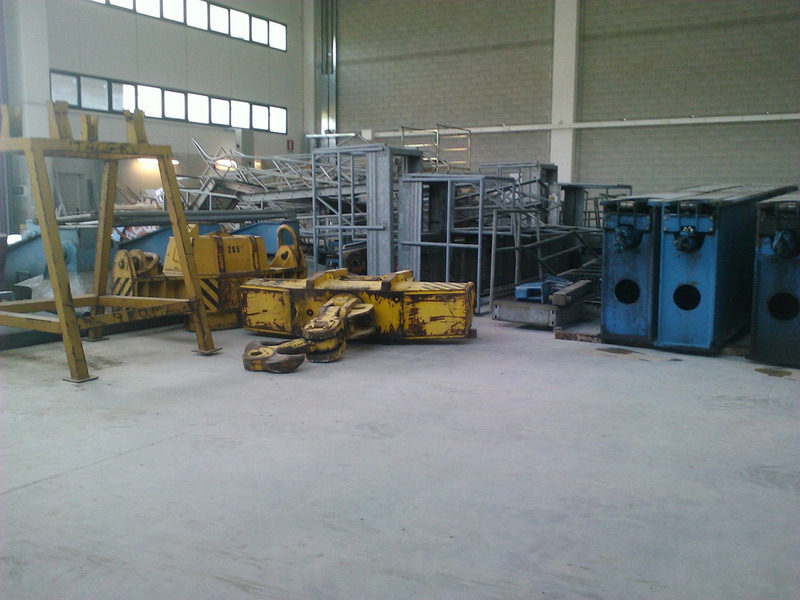 2005) New general purpose warehouse COOP Lombardia Milan of approx. 25,000m². DURSIL M was used on a large surface area of 1,000M² without contraction joints and with metal and resin construction joints to make it harder wearing to withstand heavy traffic from transpallets with hard wheels. 2004) Research laboratories of the Serono Pharmaceutical Guidonia (Rome) approx. 1.500m². We made DURSIL S which was subsequently applie dself-levelling cycle CHEMIDUR SP Micronized approx. mm. 2. 2004) Warehouse for the Department of the Army Camp Darby (Livorno) of approx. 1700m². CHEMIDUR SP was approved by the technical department of the Department of the Army to restore the warehouse flooring at this military facility. 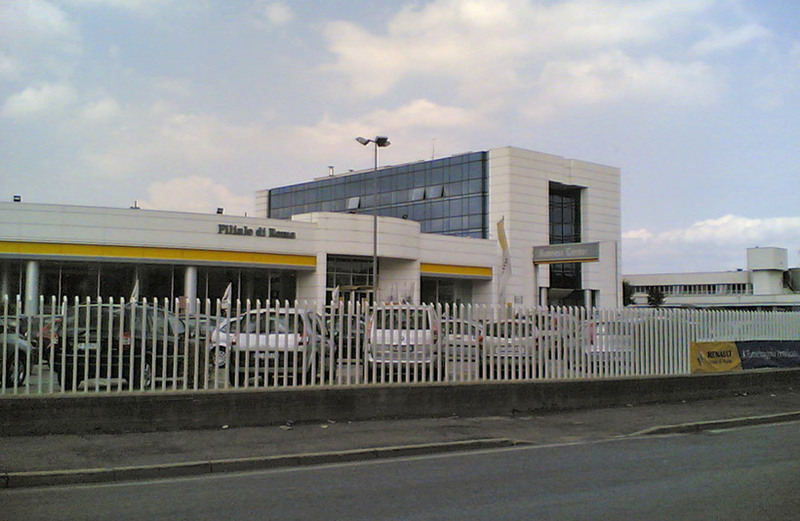 2003) FIAT AVIO Colleferro (Rome) 20.000m² DURSIL M 7.000m² COVERSIP 5.000m² CHEMIDUR SP. After 20 years since the first use of our industrial flooring this company in building new settlements, we reaffirm the full confidence and lots of work for the floor DURSIL M are appeox. 400m2 without shrinkage joints for the use of a Dursical performance concrete with steel fibers. 2002-2003) PIRELLI R.E. Car parking Bicocca Milan of 15,000m² and 25000m² COVERSIP. Pirelli R.E. chose COVERSIP for the protection of concrete surfaces of its two car parks in Milan one year apart, confirming their approval of our COVERSIP product. 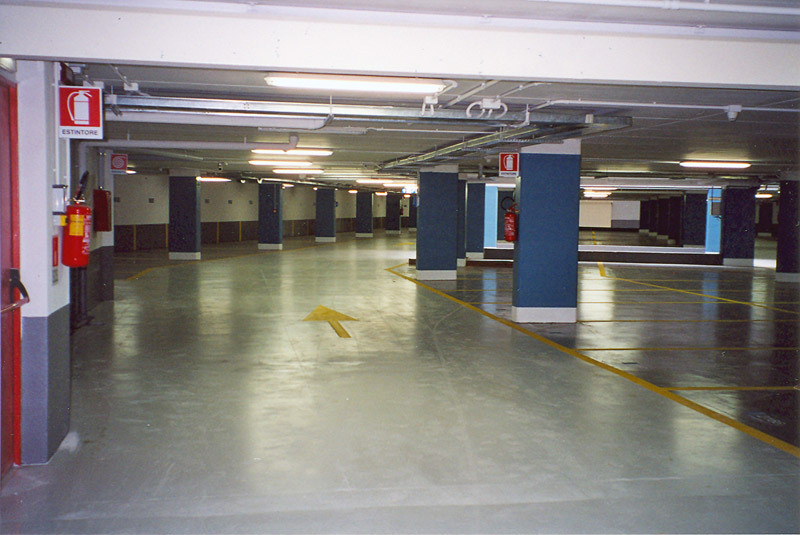 2002) Parking Garage Verona of SABA 12.000m² COVERSIP. 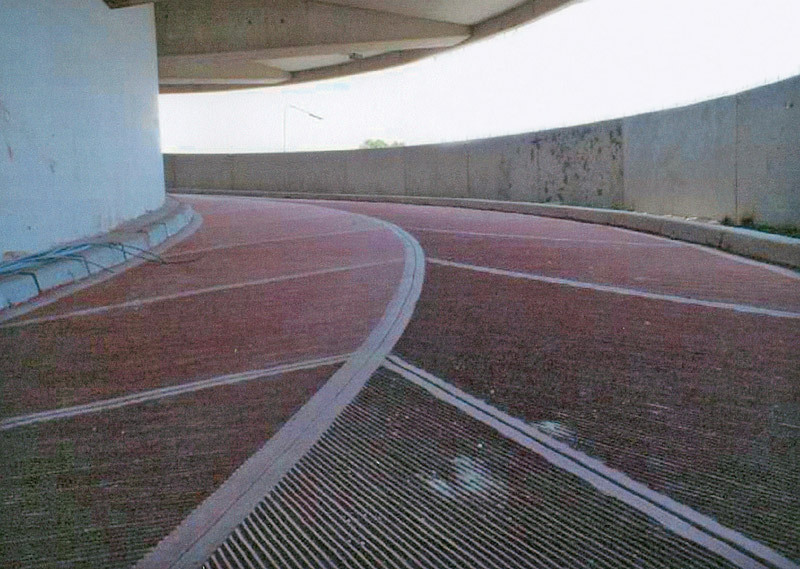 This park management company employs COVERSIP colored to protect the concrete support of the flooring with different colors identifying the lanes and stalls. 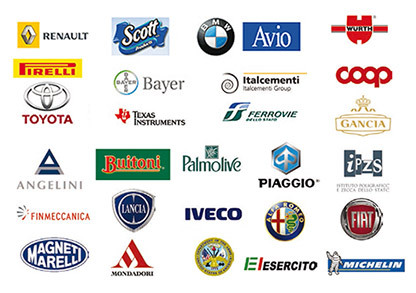 2001) Breed Italiana Holdings 15,000m² using DURSIL M, 15,000m² COVERSIP and 4,000m² using CHEMIDUR ST. The new production facility for car seat belts of the American group used DURSIL M with steel fibres and a COVERSIP anti-dust coating on the flooring. 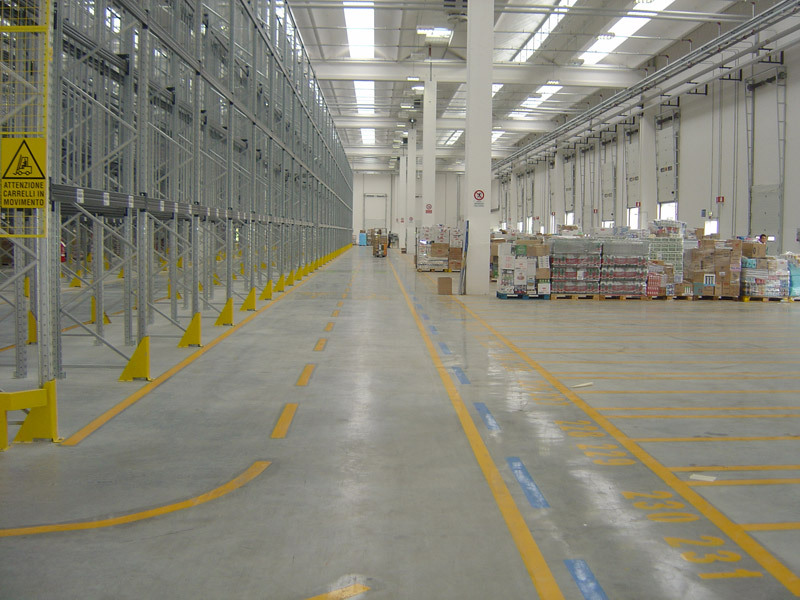 The flooring of other facilities was renovated using CHEMIDUR ST.
2001) New warehouse WÜRT Ora (BZ). 15.000m². 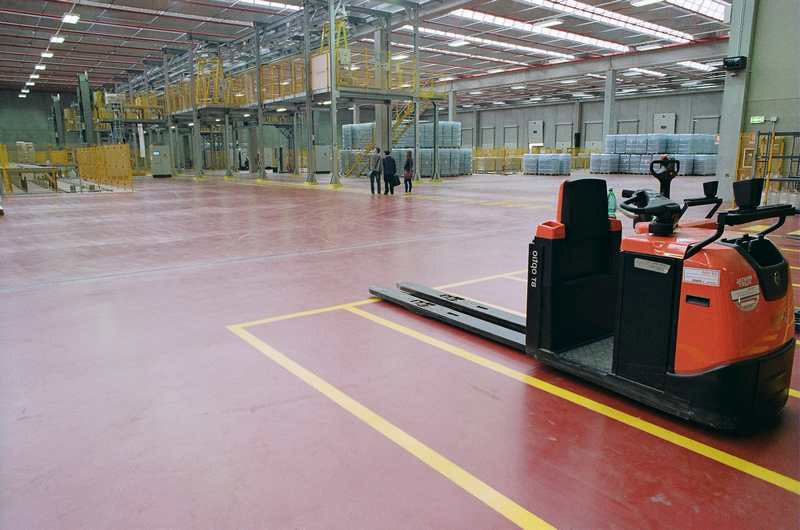 On the system of floor heating used in this complex it is installed DURSIL M for this modern warehouse shelved. 2001) TOYOTA MOTOR ITALIA 12,000m² using DURSIL M and 12,000m² using CHEMIDURS SP. The new Italian headquarters of Toyota in Rome, designed by Kenzo Tange, used steel reinforced DURSIL M and a top coating of self-levelling CHEMIDUR SP in the warehouse as well as its Training centre. This project used metal construction joints on an area of approx. 400m² without contraction joints. 2000) Parking garage 8.000m² DURSIL 10/15. As part of the building program of S. Giovanni Rotondo (FG) the parking garage is built with DURSIL 10/15 reinforced with steel fibers. 1998) RENAULT ITALIA Roma 10,000m² using DURSIL M and COVERSIP. DURSIL M, reinforced with steel fibre and a resin coating of COVERSIP were chosen for the new floor at the headquarters of Renault Italia. 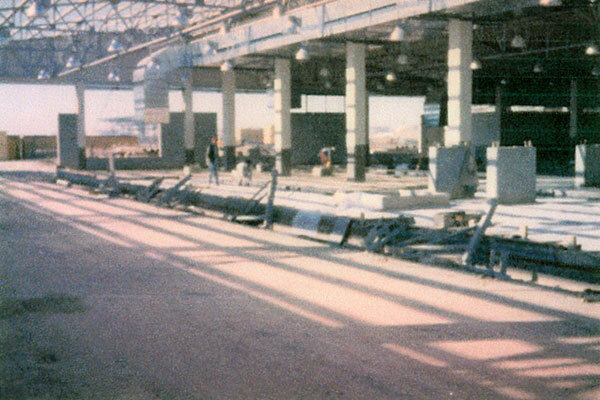 1998) New central ASM Brescia 15.000m² DURSIL M.
The new Central ASM designed by ABB and Ansaldo uses DURSIL M entirely with concrete reinforced with steel fibers and use of construction joints in metal. 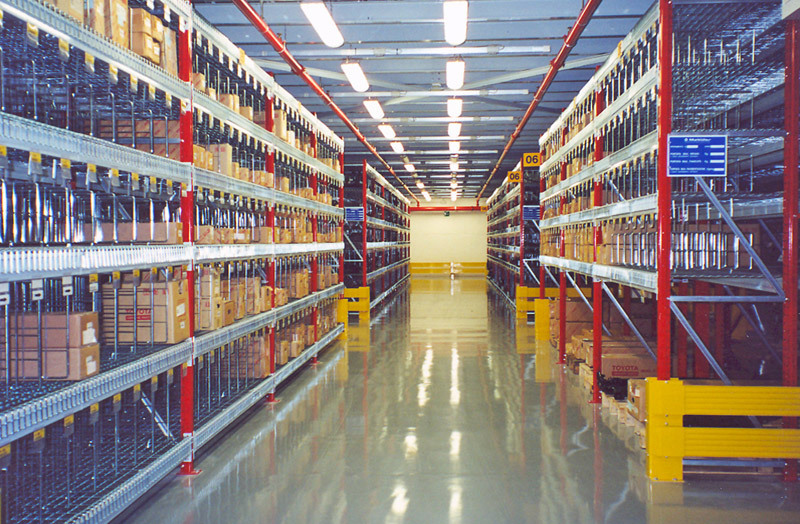 1997) SUPERAL new centralised warehouse at Pontedera of 40,000m² using DURSIL M.
Superal specified the use of DURSIL M for the construction of its new central pallet racking system warehouse which is subject to intense and high volumes of traffic from forklift and transpallet trucks. 1997) BMW Italy SpA New Headquarters in San Donato Milanese 10,000m² DURSIL M.
Serete Italy chooses DURSIL M to floor garages New futuristic BMW headquarters in Italy. 1996) MIROGLIO S.p.A. Facilities at Tessili Ginosa and Castellaneta of 60,000m² using DURSIL M.
The new Miroglio installation, particularly important in the production of yarns, used DURSIL M for the flooring throughout the facility. 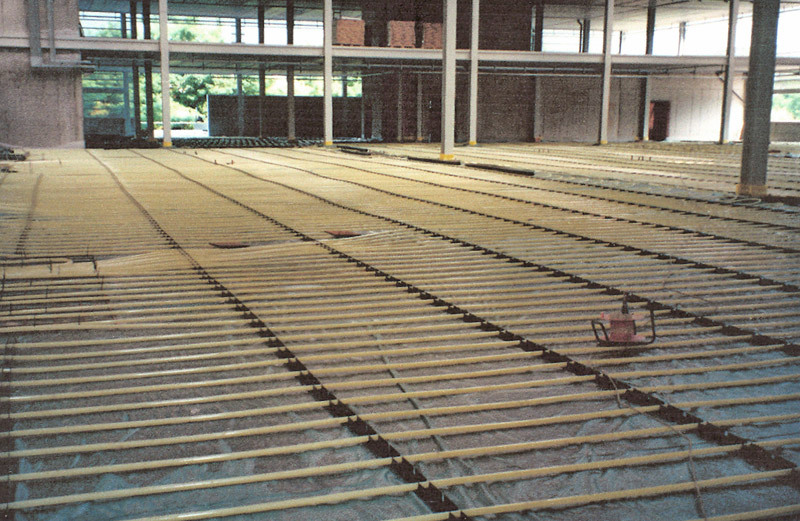 1995) FIAT Engineering S.p.A. (Leipzig Germany) 5000m² DURSIL S.
The same materials purchased in Germany for the preparation of DURSIL have been used for the flooring of the new office Fiat. 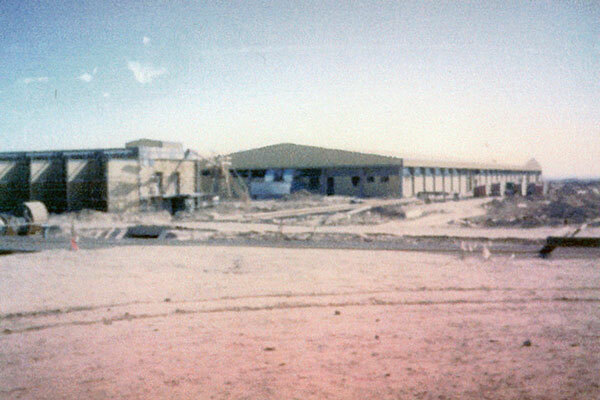 1995) ITALCEMENTI S.p.A. 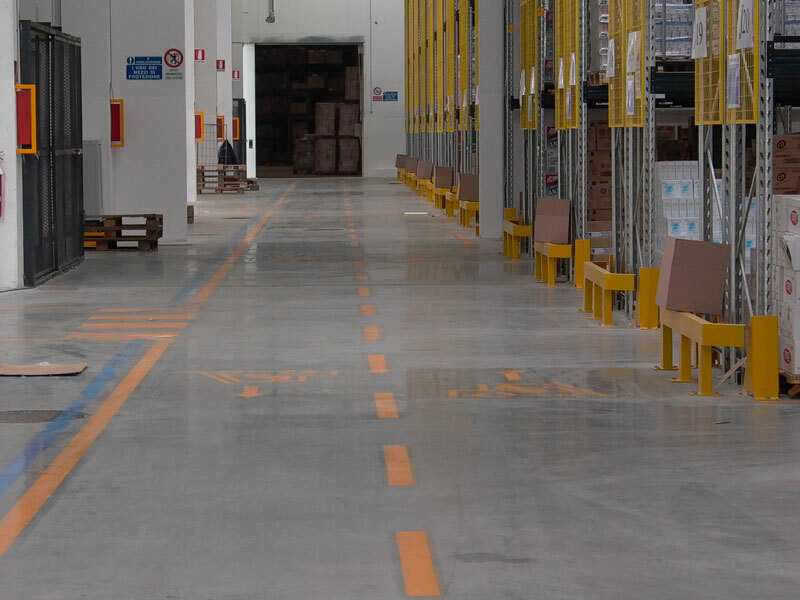 Warehouses 10,000m² using DURSIL M.
Several warehouses of Italcementi cement plants, subject to high static loads and heavy traffic, used DURSIL M.
1993) AIR FORCE HANGAR PRATICA DI MARE 15.000m² DURSIL M.
Paving from 30 cm. thick with roof mortar 1 cm. with use of molds of metal interlocking we have drawn. 1991) STATE MONOPOLY facility Lucca Bari 60.000m² using DURSIL M and 10,000m² using CHEMIDUR ST. In the construction of flooring for this organisation, steel fibre were used in the concrete. The Site Manager took samples of the concrete to manually count the distribution of the fibres used. It was confirmed from the samples taken that the fibres used in our flooring where distributed throughout the sample with only a tolerance of +/- 5 % . The anti-wear layer of 1 cm. guaranteed perfect coverage of the fibres. 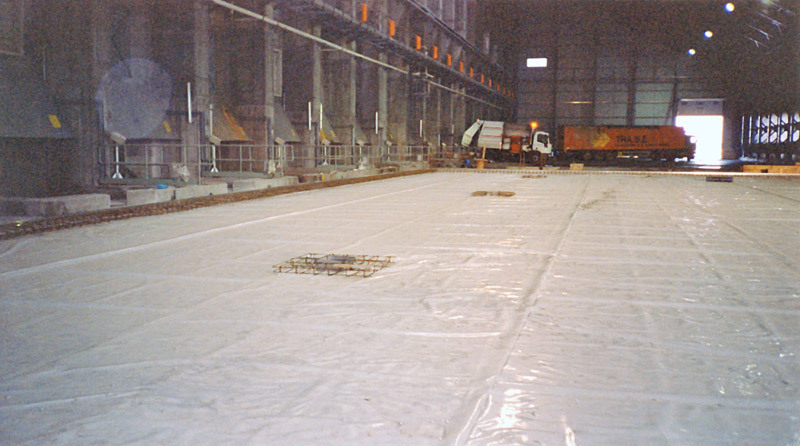 1991) COMECART S.p.A. (BURGO paper mills) Duino Facility (TS) 40.000m² DURSIL M.
Fiat Engineering has designed this floor in a facility that is located on a marshy land. Especially commitment required the preparation of the armor of the concrete, on which was placed a mortar wear a layer of 1 cm. 1989) TEXAS INSTRUMENTS Clean Room Avezzano (AQ). 10.000m² using DURSIL M.
This DURSIL M flooring was required to respect anti seismic conditions expected by the project for the construction of the facility. 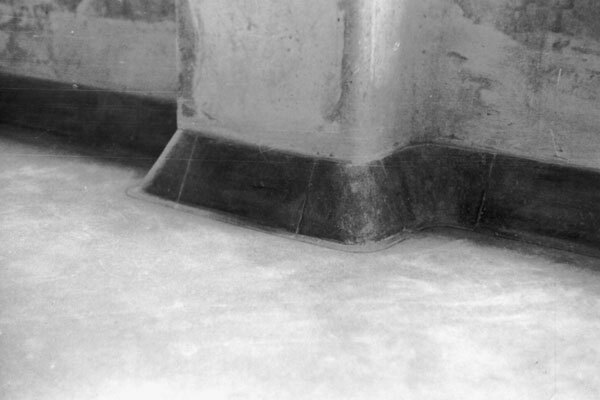 This particular condition, given the sensitivity of the construction processes, required special joints on the pillars, a steel fibre reinforced concrete screed and separation elements from the elevated structures in polyurethane foam in the preparation of the substrate. 1989) US. NAVY mechanized store 10,000m² using DURSIL S.
US. Navy achieves at Capodichino (NA) a new warehouse for the US Army. It is used DURSIL S and the work is constantly monitored by a supervisor who had been sent by the client with a computerized profilograph controls the floor with a precision that would be within 1 mm. tolerance in the corridors of shelving. 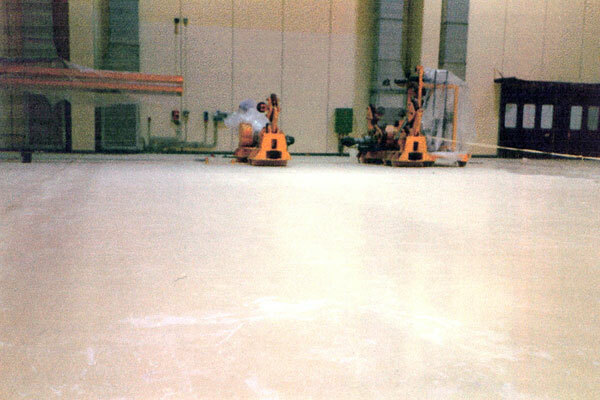 1989) SCOTT S.p.A. 50,000m² using DURSIL M.
Scott Paper Company used DURSIL M on the flooring and the production areas of its new facility at Alanno (PE) . 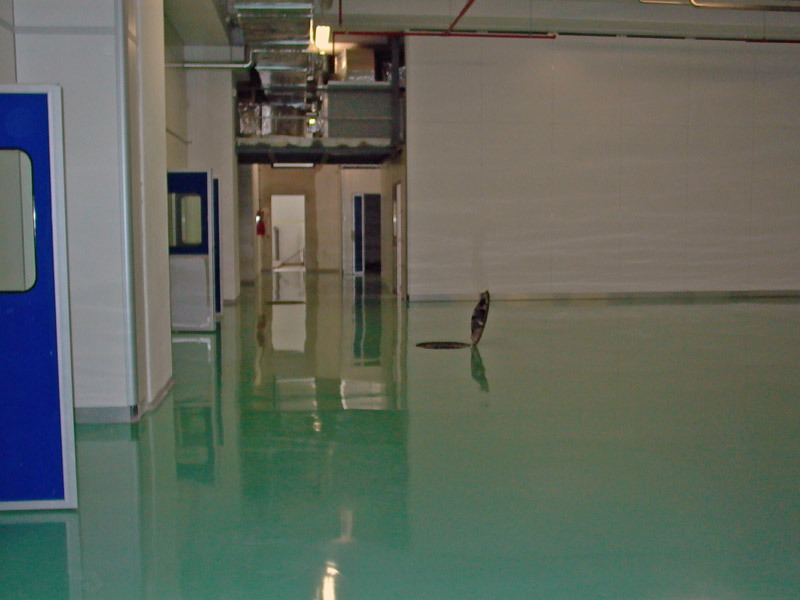 The activity of this Company for both concentrated loads as well as for the particular wear to the flooring, required a hardwearing, wear-resistant coating. DURSIL S and COVERSIP. DURSIL S is chosen as the floor with treatment COVERSIP anti-dust. 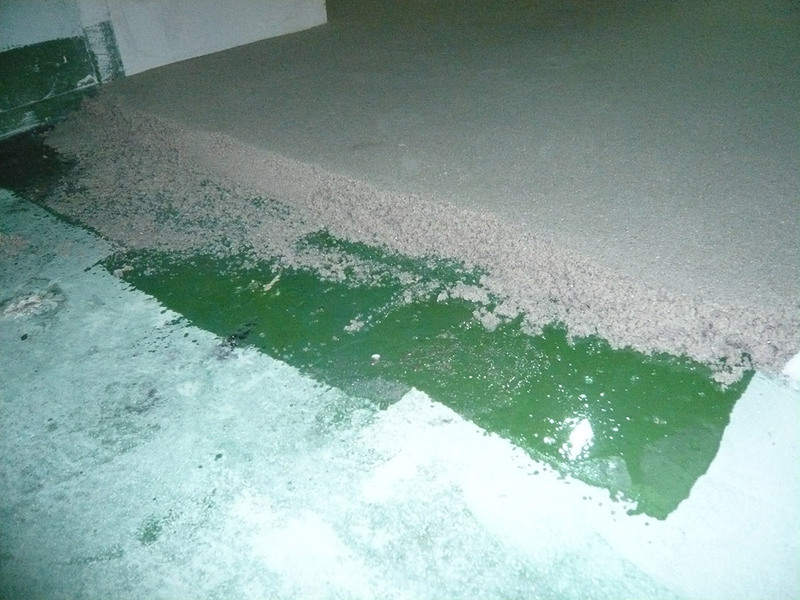 The peculiarity of this work is that our technicians are on site all the time needed to complete the project to educate the local workforce, both in the use of machinery exported than in carrying out the steps of the implementation of the floor DURSIL S and subsequently the product COVERSIP anti-dust. 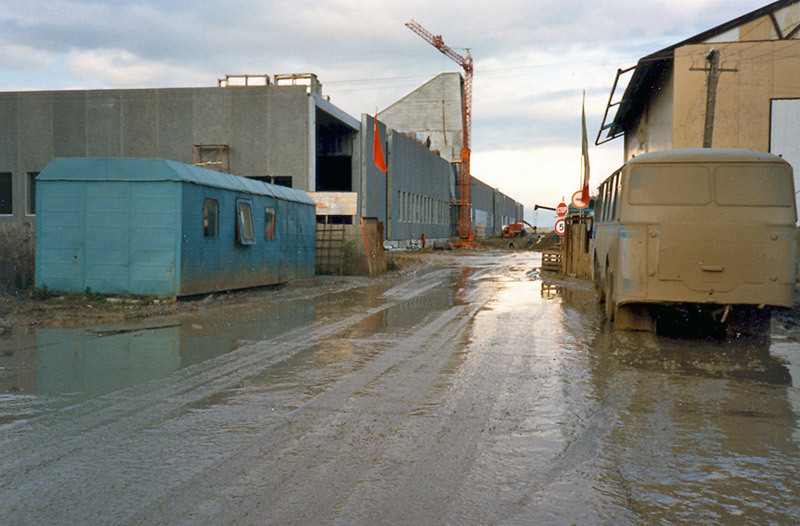 1987) COGOLO TANNERIES (USSR) of 240,000m² using DURSIL M and S.
A Consortium of Italian companies gave us the project to design and create simultaneously two tanneries of 120,000m² each in the USSR at a distance of 2,000km from each other. Given the particular condition of the soil, which was very unstable, steel fibre reinforced concrete and steel mesh and special reinforcement of the construction joints was required. The work was carried out calendar year with weather conditions reaching temperatures of minus 20°C. 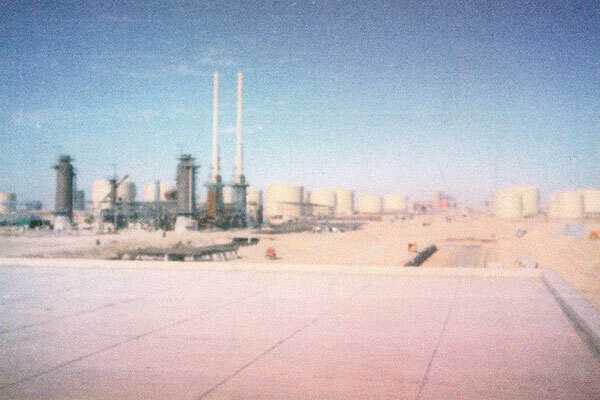 1986) LUBE OIL COMPLEX (IRAQ) 70.000 using DURSIL M.
DURSIL M is proposed by TECHNIP in Rome to build the new settlement in the warehouses of the refinery in Mosul in Iraq. We design and build the work on behalf of the Company DAELIM (South Korea) with very high temperatures (+ 50 °) with a method in mortar under the construction management of English and Swiss. 1984) BAYER S.p.A. 30,000m² using DURSIL M and 7,000m² using DURSIL 5/10. BAYER chose DURSIL M and DURSIL 5/10 to carry out the extension to its warehouse and production facilities at Filago (BG). 1982-84-93) FIAT AUTO S.p.A. 70.000m² using DURSIL M.
Among the various products that we used in the various departments, particular interest has been encountered in the use of the hardener mixture EH in the molding of the establishments of Cassino and Melfi. That product hardener composed of inert non-oxidizable metal, particularly wear resistance, it is particularly compatible with the processing of sheet metal in a beam highly technological. 1984) FIAT Avio S.p.A. 10,000m² using DURSIL 5/10 and 3,500m² using CHEMIDUR ST. 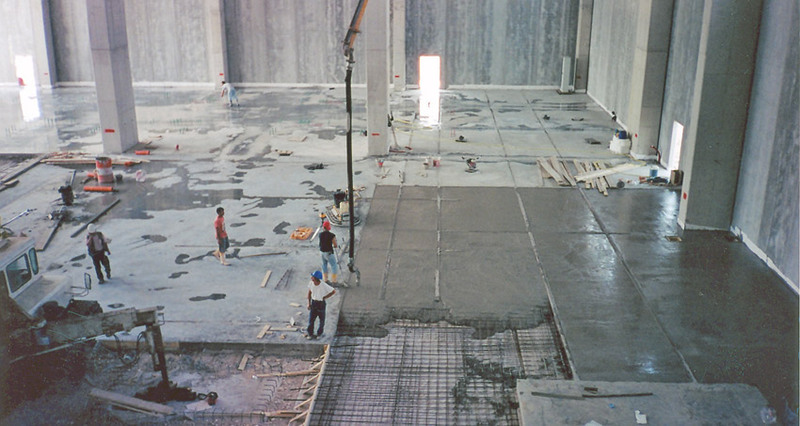 The SNIA installation at Colleferro (RM) involved the construction of new workshops for the ARIANNE space project where the particular requirement for the work involved the laying of a continuous monolithic sterile floor. The area was approximately 3,500m² and the flooring was carried out with resin mortar of approx.1cm and with a self-levelling CHEMIDUR coating in a single continuous solution. The secondary floors of the main building were carried out using DURSIL 5/10 using mortar in one of the first uses of steel fibre type 60/80 reinforced screed. 1983) SNIC (Algeria) mq. 60.000 DURSIL M.
SNIC, Azienda di Stato Algerina, attraverso la Soc. CTIP S.p.A. Soc.di Ingegneria ha rilevato nel nostro pavimento DURSIL M le caratteristiche ottimali e rispondenti alla normativa per pavimentare una delle più importanti industrie Farmaceutiche del Nord Africa. E' stata la prima esperienza estera significativa. 1982) FF.SS. 150.000M² using DURSIL M.
The General Management of the FF.SS. at that time, had seen for themselves the quality of our product DURSIL M; characteristics ideal for the planned building of the Officine Grandi Lavori (Office for Large-scale Works) project. 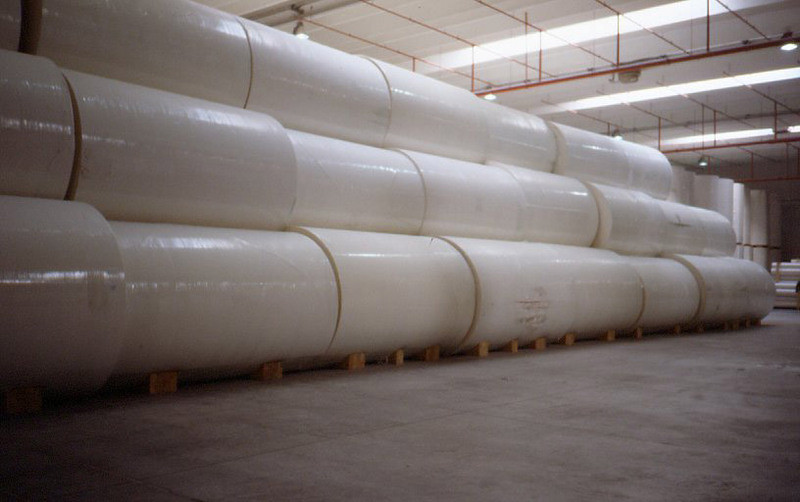 Our product was examined for verification of its hardness, chemical resistance and functionality as part of the FF.SS. Institute of Testing and Materials requirements. The product was applied in all the offices. .
1981) A.C.R.A.F. Angelini Farmaceutici S.p.A. 50.000m² DURSIL M.
This factory manufactures medicinal products and has been designed by the CTIP SpA. Engineering company. The aim was to achieve, with the materials available at that time, an acceptable sterile flooring surface to suit the requirements of the customer. DURSIL M was used for the flooring due to its low cement content and durability. The chips were highlighted through a process of buffing and polishing. This process required undoubted ability and manpower to complete the project.